Rwanda’s Martin Ngoga has been elected new Eala speaker. File photo. KAMPALA— Rwanda’s Martin Ngoga was on Tuesday elected speaker of the East African Legislative Assembly (Eala) after six months of waiting due to political events in Kenya. In the lead up to Ngoga’s election, differences among partner states threatened to tear apart the East African body, especially between Rwanda, Tanzania and Burundi with the trio jostling for the coveted seat. The differences were further reflected in the votes cast with only 36 members out of the 54 taking part in the exercise. Ngoga got 33 votes while Leontine Nzeyimana (Burundi) garnered three votes and Adam Kimbisa (Tanzania) got zero. Eighteen members, nine from Tanzania and nine from Burundi, including the ex-officios of the two countries walked out in protest. The speaker-elect now has the duty to preside over the polarised House and direct its activities over the next five years. Each member of the six partner states including Uganda, Rwanda, Kenya, Tanzania, Burundi and South Sudan send nine representatives to the Arusha-based assembly. There is no love lost between Rwanda and Burundi following a failed coup in Burundi in 2015 attempting at oust Burundian President Pierre Nkurunziza when he decided to run for a controversial third term in violation of the constitution and the 2000 Arusha Agreement that ended a decade-long civil war. Burundi has accused Belgium and Rwanda of closely collaborating with people who attempted to stage the coup plot and of arming refugees to disrupt Burundi’s security. Early this year, five representatives from Burundi snubbed the Assembly sitting in Kigali, Rwanda, citing security concerns. A crisis meeting of the council of ministers that was convened earlier yesterday to try and resolve the impasse failed to reach consensus on letting a member from a particular country to take the speakership. It was generally believed Rwanda was in line to present the next speaker but some members from Tanzania and Burundi were opposed to this. It is assumed that the post of Eala speakership is rotational from one member state to another with Uganda, Tanzania and Kenya having already served. The treaty, however, does not dictate on the order of the rotation and this has caused acrimony in the past. Following the deadlock, the Council of Ministers advised the assembly to consult with their governments on the decision over the election of the speaker. Majority members present, however, objected to the referring of the issue to the Heads of State and insisted on going ahead with the election of the speaker since a two thirds majority was present in the House and the that it was their right to elect their speaker. A decision was taken to go ahead with the election. 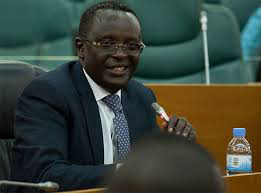 Mr Ngoga, who is Rwanda’s former prosecutor general, was first elected to the assembly in 2015 following the resignation of MP Abdul Karim Harelimana from the regional House. He is credited for having convinced the International Criminal Tribunal for Rwanda (ICTR) to transfer the remaining cases from Arusha, Tanzania to Rwanda, as well as different countries to extradite suspected genocide fugitives. He was also recently elected to the FIFA Congress as the deputy chairman of the FIFA Ethics Committee-Investigatory chamber.